How Does Climate Change Impact Water? More Profoundly Than You Think. Take #ActionForWater at the 2019 Water Docs Film Festival, March 20-24! 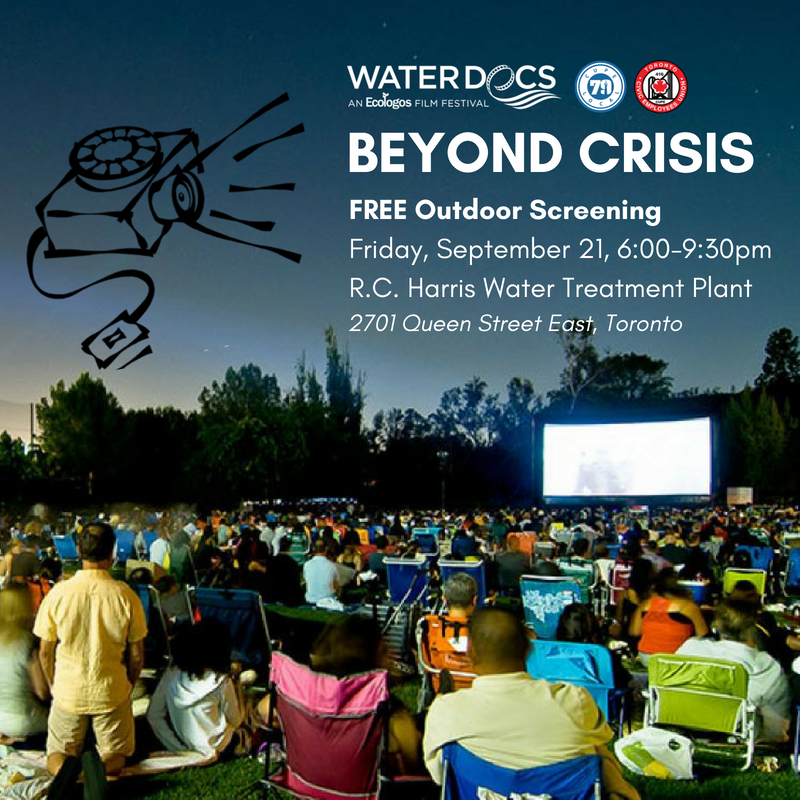 DIVE IN to a spectacular lineup of over 30 Canadian and International features and shorts highlighting the most pressing issues facing water, locally and globally. Come up for air to engage in timely panel discussions with filmmakers, activists, artists and academics. Lose yourself in immersive art exhibits and installations. Meet our 2019 Water Warrior Award recipient. Like everything on the planet, our lakes, rivers, streams, oceans and the water cycle itself are heavily impacted by climate change. The ways in which water is effected also serve as a humbling reminder of how interconnected everything is on this life-giving organism we call Earth. As the atmosphere heats up causing warmer waters, heavier rainfalls in some areas and droughts in others, the affects of climate change are exacerbated, thus continuing the harmful cycle. It is important at every step of the way to remember that climate change = water change. Anyone who is interested in protecting our waterways must also be aware and vocal about the impacts of climate change. The Earth’s water cycle is highly dependent on temperature, so it’s not surprising that the planet’s rising fever is having an impact on how water moves and circulates. Scientists widely agree that these changes in temperature profoundly affect atmospheric water vapor concentrations, clouds, precipitation patterns, runoff and stream flow patterns. As the temperature rises in the lower atmosphere, more water evaporates from both land and oceans and is held in the troposphere (lower atmosphere). Warmer air can hold more water vapour, one consequence of which is an increased frequency of heavy rainfall events. Because of the warm air, more precipitation is falling as rain than as ice or snow. This leads to extreme flooding in coastal communities around the world. At the same time, other areas will experience drier air and drought due to the same rise in temperatures. The warmer air that causes increased evaporation makes the soil dry out. When rain does come, much of the water runs off the hard ground into rivers and streams, and the soil remains dry. The Palmer Drought Severity Index is a measure of soil moisture using precipitation measurements and changes in evaporation and is being used to monitor these issues around the world. Infographic from The Climate Reality Project highlighting how climate change impacts the water cycle. As mentioned above, Earth’s warming atmosphere is going to result in more precipitation falling as rain rather than snow. Why is this important? Some regions depend on the gradual melting of the snowpack to supply surface water throughout the warmer months. A diminished snowpack results in lower flows and greater water stress during the summer – a trend that is already being observed worldwide. Water scarcity at the surface will result in a greater reliance - and overuse - of limited groundwater reserves. 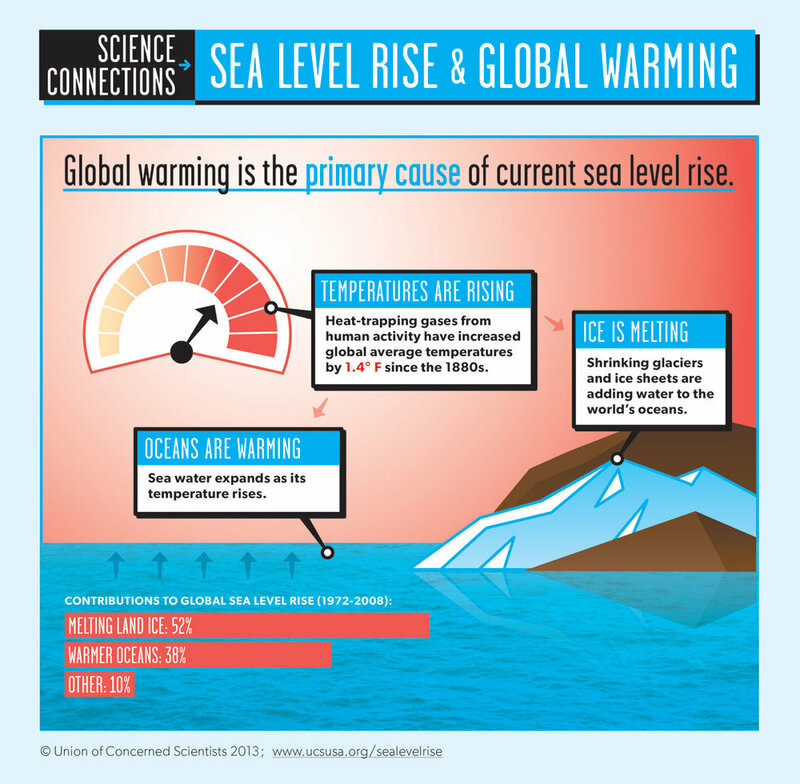 One of the more well-known talking points in reference to the impact of climate change on water is the resulting global sea level rise. Climate change-induced sea level rise will occur for two main reasons: the expansion of the ocean as it warms, and the increased melt from ice sheets, ice caps and glaciers. Beyond the devastating impact this will have on coastal communities and infrastructure, it also has serious implications for the planet’s freshwater reserves which can be contaminated by saltwater. If this were to take place, water from aquifers would need to be treated with an energy-intensive process to be useful for irrigating crops or drinking. The ocean stabilizes our planet’s climate system through its role as the largest solar energy collector on Earth. Our oceans store and release heat over long periods of time without themselves increasing in temperature. But that - like so many other things on our planet - is changing. As increasing concentrations of greenhouse gasses enter the atmosphere due to human activity, heat radiating from the Earth’s surface becomes trapped and can’t escape into space as freely as it used to. Can you see where this is going? Yup, that’s right - most of that excess heat is being stored in the upper ocean and the ocean is now heating up. If the ocean absorbs more heat than it releases, its heat content increases. There is a massive system of circulating seawater called the Atlantic Meridional Overturning Current (AMOC) - also referred to as the ‘Ocean Conveyor Belt.’ It plays a key role in the global climate system and so any significant alterations to it impact everyone around the world. The AMOC serves as the engine for the planet’s ocean currents: the massive amount of cooler water that sinks in the North Atlantic stirs up that entire ocean and drives currents in the Southern and Pacific oceans. Through moored instruments that track currents far beneath the surface, Scientists have been gathering evidence that suggest rising sea temperatures and increased freshwater from melting ice due to climate change are disrupting, weakening and slowing this crucial current. Moorings installed in the middle of the Atlantic back in 2004 have revealed the current to have weakened by as much as 30 percent since 1957. Why is this so important? The AMOC functions due to the density of cold and salty water. The cold waters sink in the North Atlantic and move south, while the warm tropical waters at the surface flow north in the Gulf Stream. If northern waters heat up or the salt becomes diluted from fresh melting ice, the water stops being dense enough to sink. This causes a ‘jamming effect’ for the water trying to move north, and the system grinds to a halt. If emissions continue to go up and global temperatures surpass 4 degrees C, the AMOC could slow by 54% by the end of the century, resulting in numerous and cascading effects for global temperatures, rainfall patterns and weather systems. Infographic demonstrating the movement of AMOC and the role it plays in regulating global temperature and weather systems, from Aquaculture Directory. Algal blooms have been put front and centre in climate change discussions this year as the ‘Red Tide’ off Florida’s southwest coast has killed fish, manatees, sea turtles, dolphins and even a whale shark, all confirmed to have been poisoned by the toxic algal bloom. The toxic algae worked it’s way up the coast from Sanibel Island to Tampa Bay causing the Governor of Florida to call a state of emergency for seven counties along the coastline. While algal blooms are ‘normal’ occurrences caused by runoff of nitrogen-rich material from agriculture and farming, they don’t usually get this bad. The increase in severity and occurrence (there have been 300 noted since 2010) in recent years is being linked to warming temperatures caused by greenhouse gas emissions and climate change. As air and water temperatures increase, the environment becomes more hospitable to toxic algal blooms. This is exacerbated by extreme rainfall, which washes even more fertilizer into waterways, and increased CO2 levels, which helps them expand. As temperatures rise in freshwater bodies, like the Great Lakes, a form of algae known as cyanobacteria flourishes. When cyanobacteria mixes with runoff from farms and warmer waters, red tides worsen and poison drinking water, as happened along western parts of Lake Erie. Droughts also intensify the blooms in freshwater areas - without fresh rainfall, water becomes more salty and therefore falls risk to algae that would normally only be found in the oceans. Not only are the algal blooms intensified by climate change, the methane and C02 they themselves release back into the atmosphere then intensifies climate change creating a toxic feedback loop. 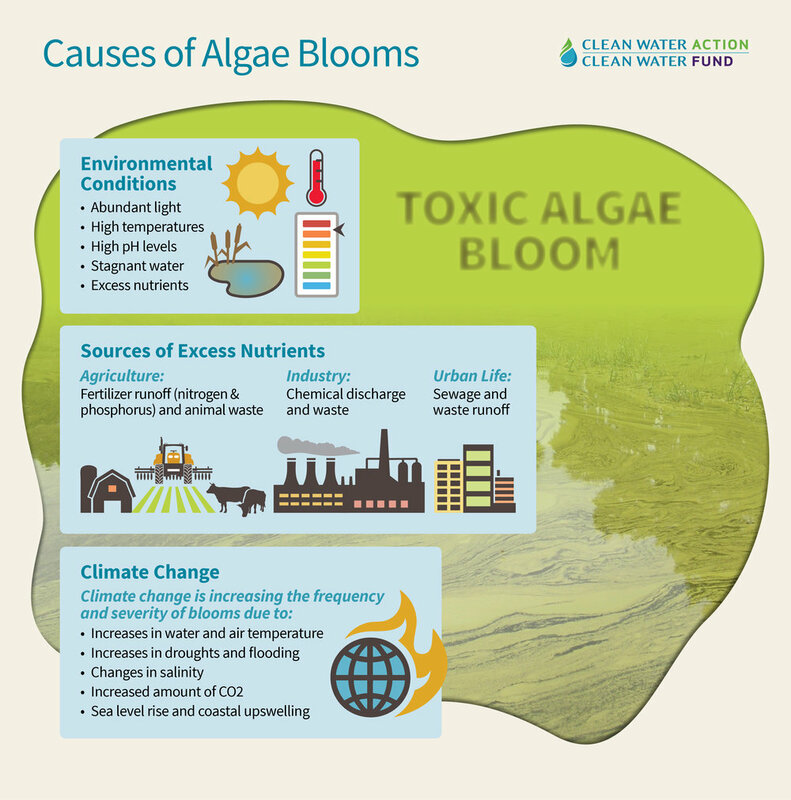 Infographic showing how climate change is causing an increase in algal blooms, both in severity and number of occurrences, from Clean Water Action. 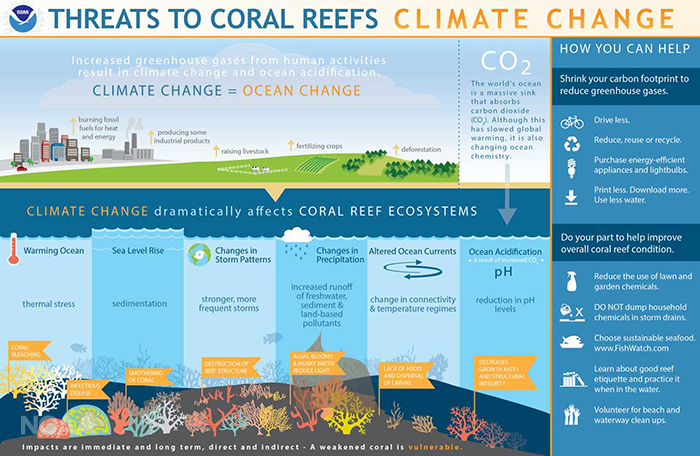 Climate change is the number one threat to the world’s coral reef ecosystems thanks to the combination of several factors mentioned above - sea level rise, heating of the oceans, ocean acidification due to increased C02 levels, changes in precipitation and altered currents. Rising ocean temperatures: can cause ‘thermal stress’ to the creatures, resulting in coral bleaching and leaving them prone to infectious disease. Sea level rise: for coral near land, sea level rise can cause a sedimentation runoff, smothering the corals. Altered ocean currents: lead to changes in connectivity and temperature regimes that contribute to a lack of food for corals and hampers the dispersal of coral larvae. Ocean acidification: causes a reduction in pH levels which decreases coral growth and structural integrity. This is a guest blog from @itsahashtaglife, a social media manager, storyteller and blogger for non-profits and charities in Toronto. She applies the tools and techniques of traditional digital media marketing to organizations working hard to shift our world into a new story – one that is more sustainable and supportive of people and the planet.